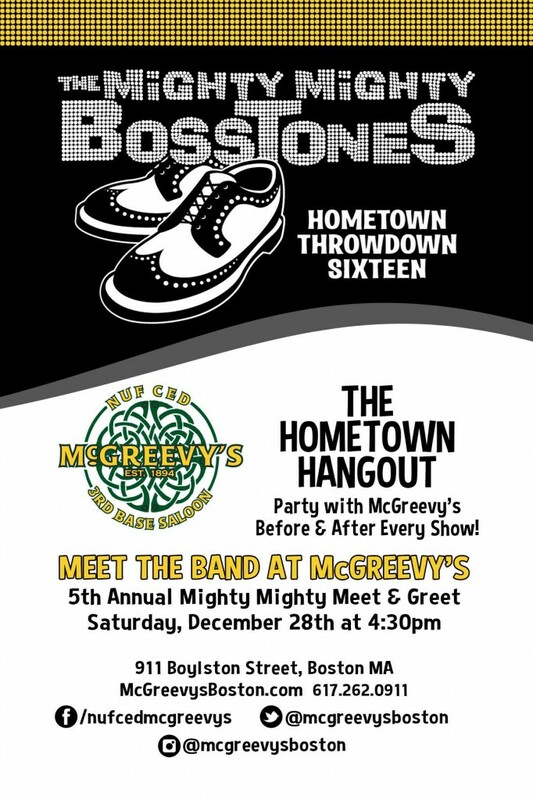 For the 5th year running, McGreevy’s bar in Back Bay will host the Mighty Mighty Bosstones and their fans for a meet and greet prior to night 2 of their 16th annual Hometown Throwdown, Saturday, December 28th. McGreevy’s takes the title of “America’s First Sports Bar,” opening as the Third Base Saloon in 1894 by Michael T. “Nuf Ced” McGreevy. Located a mere 1,200 steps from Fenway Park, the bar was re-opened in 2008 by Ken Casey, bassist for Dropkick Murphys. It’s only fitting that Dropkick incorporated McGreevy into their cover of Tessie. It’s worth reading the history over at McGreevy’s website. The hangout starts at 4:30pm at 911 Boylston St across from Hynes Convention Center. We’re going to assume that this is a 21+ affair and that there’s no cover. Doors open at the House of Blues at 6pm and it’s about a 15 minute walk over. To the best of our knowledge, tickets are still available for each night, but Ticketmaster is claiming Saturday night’s are running out. RadioBDC is also giving away tickets.